Ask: Is this “found cell” the first time we’ve seen the FirstName it contains? Ask: And if cell is not the first time we’ve seen this FirstName for an email address? 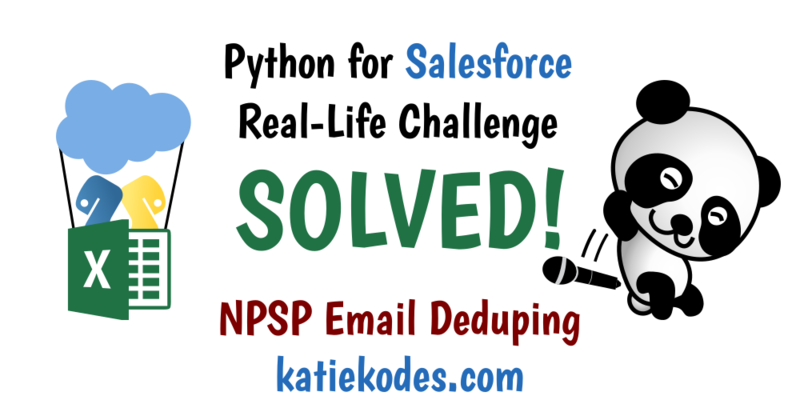 Salesforce #AwesomeAdmin Matthew (@matthewsalibi) asked how he could use Python to deduplicate Salesforce NPSP email addresses across several fields. Today I’ll provide you a script you can copy, paste, and try on your own data. And for the geeks, I’ll break it down and explain how every line works. To identify entire rows suspected of being redundant Contacts, Matthew proposed a “ready for DemandTools” file “output2a.csv” that would look like the data below. This data is compatible with the “Select Master / Non-Master records from file” functionality of DemandTools’s “Single Table Dedupe” module. Each row indicates a “same email address, same first name” pairing that was found in multiple Contact records (where the “email address” could have appeared in any of the “Email” fields that come with the NPSP). Each column is the Salesforce ID of a Contact in which the email address was found. For sets of Contacts that shared an email address but not a first name, Matthew wanted to see a bit more detail in the output file “output2b.csv”, to facilitate human review. He suggested it look like the output below. Unfortunately, I haven’t yet made a blog post about running Python code on your own computer, so if you’re totally new to Python, you’re a bit stuck – but show this code to a colleague who does know how! Or, if you’re adventurous, download an “Anaconda suite” installer for your computer’s operating system and give it a try. Don’t bother installing VSCode when it asks if you want to. Type print('hello') in the code-editing panel at the left, hit “run” near the top (if a box pops up, hit “cancel” and do it again), and then check to see if hello is printed at the right-hand side of your screen in an output console (probably bottom right). If so, congrats – you just wrote a program! Backspace out print(hello) and copy/paste my code in instead, then start tweaking it. And stay tuned for my “office hours” and “hands-on trainings,” where I teach total non-programmers to run code like this. There’s no shame in simply copying this code, pasting it into your Python “IDE,” and making a few tweaks! You will, of course, have to do a bit of “Find & Replace” to fix up column-name references (which, by the way, are case-sensitive to match their capitalization in your input CSV file), if your columns aren’t precisely spelled “PersonalEmail,” “WorkEmail,” “Human-Readable ID,” etc. You don’t have to thoroughly understand the code above to make use of it. Just be sure that your “output” files are different filenames than your “input” file and you can’t do too much damage. Worst-case scenario, you’ll freeze your computer running the program against too large of a file – but several million rows is nothing (a minute or few), so get up and stretch. It’s good for you! 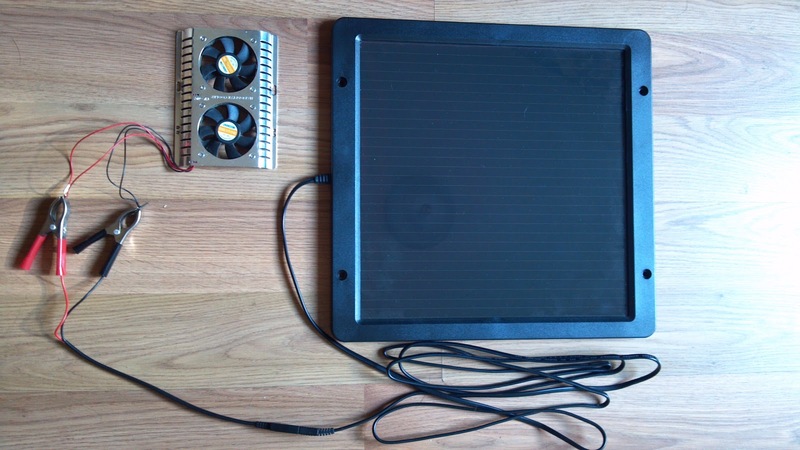 For the curious, the rest of this post is total geekery peeking under the hood. First we import the time extension to Python and start a clock running (so we can tell, at the end, how long our script took to run). Next we import the pandas (spreadsheet-processing) extension to Python and say that, should we display any of its data on our screen with a print(...) command (although in this script we don’t), we want to make use of our full screen width before trying to “wrap” excessive columns onto overflow lines. We’ll create a “variable” (nickname for use later in our code) called emFieldNames, and in it, we’ll store a list of the names of columns where email addresses can be found. In a variable called pickToField, we’ll create a “dictionary,” or “dict,” that lists out the values we might find in our PreferredEmail column, and clarifies what “email address” column headers they each correspond to. In the variable inputFilePath, we’ll specify where on our hard drive our file “contacts.csv” can be found. In the variable output1FilePath, we’ll specify where to save our output file (if there is data), and in output1NoneFoundFilePath we’ll specify where to leave us a note saying there was no data. Now we’ll use pandas to read “contacts.csv” into Python. Right away, we’ll add a column to our table df called ChangedAnything, with values of False all the way down (since we haven’t yet changed anything). Next, we’ll build a special type of list specific to Pandas called a “Series” that will indicate, for each record in PreferredEmail, whether the value found there is a legitimate name of a column in df (always good to check for typos). We’ll set that aside in a variable named validPrefEmailIndicatorTFSeries. These next two lines are … a bit of “Python magic” … but what they do is add a new PrefEmAddr column to our df table that contains the actual preferred email address of each Contact record. Now we’ll “loop” over one “email address” column name at a time (as listed out in emFieldNames). Any code “inside” this “loop” will be able to tell which “column name” we’re currently inspecting, because for the duration of a given “pass” of the loop, an appropriate value ('PersonalEmail', 'WorkEmail', or 'AlternateEmail') will be stored in the variable fieldName. First thing we’ll do within each “loop” is build a special list (again, a Pandas “Series“) of whether or not (True or False) we find each row of the df table “interesting.” We’ll save that list into a variable called needsClearingTFSer. In this case, “interesting” means that for a given row of our df table, its value in the PreferredEmail column is not the column we’re currently “looping” over (as specified in fieldName), but that the email address found in the actual column specified by the current value of fieldName is the spelled exactly the same as the email address found in the same row’s PrefEmAddr field that we built earlier. We’ll also set ChangedAnything for a given row to True if we … well … changed anything. Matthew asked that we only show lines where we changed something, so we’ll create a new copy of df and call it output1df. This copy will be filtered to only contain rows from df where changedAnything was True. Finally, we’ll save output1df to our hard drive (or a “no records found” message instead) with the following code. The index=False setting means “don’t bother to write pandas’s internal row numbers as their own dedicated column in the output. Finally, as a nice touch, we’ll put some text on our screen to announce that the code is done running and to say how long it took to run. To ensure that we get the right Salesforce Contact IDs assigned to “Master” vs. “Duplicate 1” columns, we’ll need to ensure that we keep track of certain discoveries we make in a specific sequence. Python’s OrderedDict extension will let us do this. In a variable called pickToField, we’ll create a “dictionary, or “dict,” that lists out the values we might find in our PreferredEmail column, and clarifies what “email address” column headers they each correspond to. Matthew specifed that the alphabetically earliest Human-Readable ID value for a given “grouping” of “likely duplicates” should be the “Master” for that grouping. Since a lot of the tricks we’ll play in this code read things in the order we started with them in in df, we’ll just re-sort df. Notice that at this point, the “row IDs” start with 9, then go to 0, then 10, then 1, etc. We’ll fix that next. Told you we’d fix the row IDs. The order in which we list the fields that should move into “row ID” matters. We need to make sure that the first item listed when we do this is something that uniquely identifies each row (if we couldn’t find such a piece of data, we’d want to include the old numeric “row ID” as the first item in this list – but I’m not going to show that code right now). That will help ensure that when we do a sort of “pivot”-like operation, we know that any “row ID” we find is truly the ID of a row, and not of a group of rows. Our df table now looks something like this (the row IDs don’t literally look like that with the // characters, but it’s a decent representation of what’s going on). Pandas’s stack operation against the 3 column names we previously set aside in our emFieldNames variable works something like that those first 4 steps. It produces a special type of list specific to Pandas called a “Series)_”, which we’ll set aside into a variable called allEmailsSeries. You’ll have to trust me, but the next line of code is “Python magic” that produces a list of email addresses found in allEmailsSeries and, for each email address, details about the rows where it was found. We’ll save that information aside in a variable called groupedEmailSeriesGroupItems. groupedEmailSeriesGroupItems isn’t pretty, but here it is, just in case you’re curious. 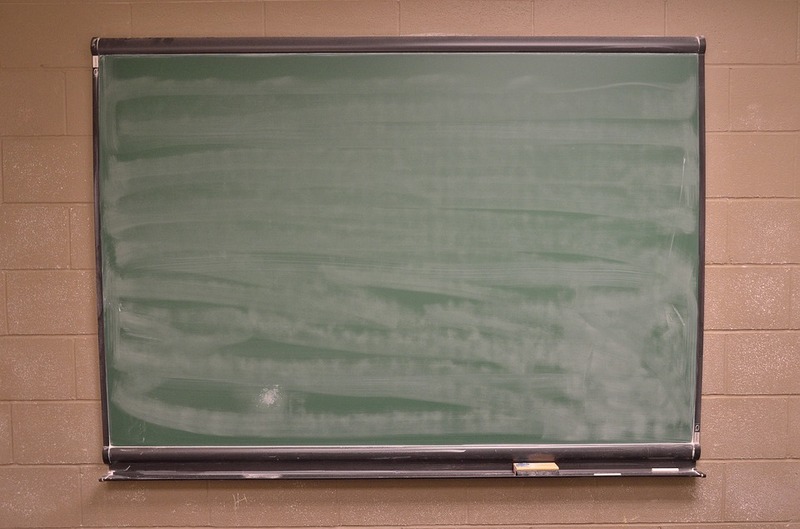 Trust me – the computer can read it, even if it’s hard for us to read. We’ll save this new information into a “dictionary, or “dict,” variable called emsAndTheirCellsFound. In this explanation, I’m still referring to “cells of df,” but honestly, we’re never going to use df again. We don’t need it. Everything we need to know is in emsAndTheirCellsFound, thanks to us changing the “row IDs” of df to include the data we’d want later. Avoiding the need to go back and consult df for details like first name, last name, Salesforce ID, etc. helps our script run faster. We create 2 empty “lists” as a place to store data we build inside the upcoming “loop” that we’ll want in our final output (each item in the “list” will become a row of our output CSV file). Now we’ll “loop” over one “email address” (e.g. ca@gp.com) at a time. Any code “inside” this “loop” will be able to tell which “email address” we’re currently inspecting, because for the duration of a given “pass” of the loop, its value will be stored in the variable emAddr. Also accessible to us will be a “list” of details about each “cell” of df where that email address was found, accessible under the variable name foundCells. For example, while we look at ms@hotmail.com, foundCells will contain a 2-item list, telling us that was found at the intersection of LLLL and WorkEmail and at the intersection of LLLL and AlternateEmail (along with some other details about those “cells,” such as the FirstName, LastName, etc. for the row where LLLL was the Human-Readable ID). First thing we’ll do the moment we pull up a given emAddr and its foundCells list is set up a blank place to store “per-email-address”-level information we decide we want to set aside, as well as take a snapshot of how many items are in foundCells. Presuming there actually are several “cells” of df where an email address was found, now we need to loop over those cells. Any code “inside” this “loop” will be able to tell which “cell” from foundCells we’re currently inspecting, because for the duration of a given “pass” of the loop, its value will be stored ine variable cell. Also accessible to us will be a plain old number indicating which “pass” of this “inner loops” we’re on, stored in cellLoopCounter. `cellLoopCounter’ starts at 0, not at 1, on its first pass. Our program can also still see the “outer loop” information like what the current contents of emAddr are. cell is a type of Python data called a “tuple” that looks something like ('EEEE', '003...03', 'Jason', 'Mendoza', 'Work', 'PersonalEmail'). You can fetch any one of those things between the commas by putting its “position number” right after the word cell in square brackets … just remember that the first one is 0, not 1. So, for example, when ('EEEE', '003...03', 'Jason', 'Mendoza', 'Work', 'PersonalEmail') is the current value of cell, then cell is Jason. We’re going to keep a running list of “the first time we’ve seen a given FirstName for a given emAddr. If we haven’t yet seen a FirstName before (within a given email address), we set it aside in seenFirstNamesAndTheirContacts along with a copy of cell that contains all of its values except that last one (the one specifying which email address column the email address was found in). That’s what the [:-1] means. In other words, we’re just grabbing the info from cell that identifies the row or the person (Contact), not every last detail about where they had that email address. Furthermore, if it’s our first time seeing a FirstName for a given e-mail address, we’ll check if it’s our first pass through the foundCells for that e-mail address at all. If it is, we’ll grab some details about that e-mail address and set them aside in an empty “dictionary” called output2bFact that we created when we first pulled up the current emAddr. If it’s our first time seeing a FirstName for a given e-mail address, yet it’s not our first cell for the e-mail address altogether, then it must be a duplicate record (e.g. Ellie when we’ve already seen Eleanor), so we’ll keep fleshing out output2bFact with details about this new record. We’ll decide if it’s “duplicate 1,” “duplicate 2,” etc. by counting how many FirstNames we’ve already seen for the current emAddr and subtracting (the first one was “master” and sort of counts as “0,” but the count will be “1,” so now we have to subtract 1 to get our numbers right). On the other hand, if we’ve seen this FirstName before for this e-mail address, we’ll just create a copy of cell that contains all of its values except that last one (the one specifying which email address column the email address was found in) and append it to the end of the list we’re keeping in seenFirstNamesAndTheirContacts. Subtle issue: if a given e-mail address is found in multiple columns for the same Contact (which could happen if we didn’t first run our “Output1,” fix the data with Data Loader, and re-fetch our Contacts), we will end up with redundant copies of the “Contact” data (e.g. ('EEEE', '003...03', 'Jason', 'Mendoza', 'Work')) stored in seenFirstNamesAndTheirContacts. That’s not a big deal, though, because Python is really good at detecting duplicates of that sort, and we’ll deduplicate for that later in our code. We have some code that only makes sense to run when we’ve finished looping through the last cell in foundCells for a given emAddr. For example, now that we know we’ve finished building output2bFact (because we’re all the way through all the records for an emAddr), we can check to see if it even had any “duplicates” by looking for “Duplicate_1”. If such a property of output2bFact exists, we can go ahead and dump output2bFact into our “temporary holding list” output2bList. I’ve run out of “table of contents” indents (I can only go 6 levels deep), so we’ll have to talk about the entirety of this block of code here. If we’re dealing with the first contact for a given firstName, we’ll set it aside our empty “dictionary” called output2aFact that we created when we first pulled up the current firstName. Now that we know we’ve finished building output2aFact (because we’re all the way through all the records for a firstName within an emAddr), we can dummy-check to ensure that it had any “duplicates” by looking for “Duplicate_1”. If such a property of output2aFact exists, we can go ahead and dump output2aFact into our “temporary holding list” output2aList. Phew! All done with loops! We’ll dump them both to files on our hard drive, specifying that we want a plain .txt file with a message if there are no output rows, but writing to .csv if there are output rows. In the case of outputting a CSV file, we’ll make it easy by converting output2aList into a Pandas “DataFrame” called output2adf and doing an equivalent operation for output2bList, since Pandas “DataFrames” are so easy to convert to CSV. In this case, we do get output.